Thursday, February 14 we open registrations for the 9th edition of msg Apuseni Marathon. Top runners among whom we count Robert Hajnal and Viorica Henry have announced their presence at the start of the May 25th races, where 1750 runners from Romania and abroad are awaited. The races are open to professional and amateur runners, who are awaited at Băișorii Mountain Resort to discover #inamountainbeat one of the 5 courses: ultramarathon 73,6k, marathon 43,7k, half marathon 21,1k, cross 7k or the 3,2k family race. During the first weekend of registrations (February 14-17), the organizers offer early bird fees for 500 race kits: 50 for the ultramarathon, 100 for the marathon, 200 for the half marathon, 100 for the cross and 50 for the family run. 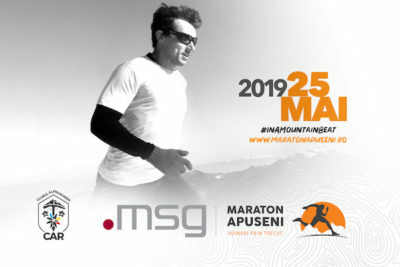 On May 25th, 2019, Apuseni Mountains and the picturesque Scărița Belioara Nature Reserve are once again the hosts of the popular trail running competition msg Apuseni Marathon. The event and its 9th edition are organized by the Romanian Alpine Club, Cluj University section and Clubul Sportiv Alpin Universitar with the support of the main partner, msg Romania. Both ultra and marathon races remain ITRA certified, the finishers of these races receive 3 ITRA points (ultra) or 2 ITRA points (marathon). 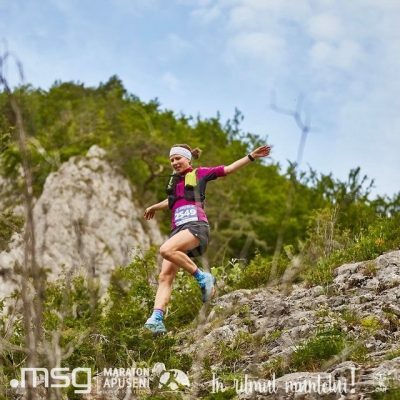 msg Apuseni Marathon ultra race is among the first of its kind scheduled in the Romanian trail running calendar of events. The organizers invite on this occasion all runners who wish to prepare for the summer races or those who want to gradually make the transition from marathon to longer distance runs, to register for the limited 100 places available at the 73,6k race. April 10th, 2019 / 6:45 pm / The Office Cluj-Napoca / Conversations with specialists, on health-related subjects, about instruments and methods for monitoring health when practicing endurance sports. May 8th, 2019 / 6:45 pm / The Office Cluj-Napoca / guest: ROBERT HAJNAL. An open conversation with the winner of the ultramarathon race at the 2018 msg Apuseni Marathon and 2018 UTMB vice-champion. The story of msg Apuseni Marathon is the story of all the 7000 runners who have participated at the 8 editions of the event. In 2019 we celebrate 9000 stories and 9000 runners who cross the finish line in the picturesque Apuseni Mountains. We are curious to hear their stories and we invite those who wish to share them with the community to send us pictures from races or trainings to the e-mail address comunicare@maratonapuseni.ro or to publish them with the hashtags #9000stories #inamountainbeat. Next, the organizers will publish this content on the race social media channels.